Boggabri parish was served from Maitland until 1875, when it was attached to the newly-formed parish of Gunnedah. In 1887 the parish of Gunnedah became part of the Armidale Diocese (founded 1871). In 1886, Fr Cornelius McAuliffe built the old church and this was the centre of workshop until 1939. In 1924, Boggabri became a separate parish and the first Priest was Fr L J O’Reilly who remained here until 1938. Fr O’Reilly built the Presbytery which was blessed on 10 October, 1926. Before leaving Boggabri, Fr O’Reilly had cleared all debts and had left £2000 for a new church. The new Priest in 1938 was Fr F Hogan and he had the plans for the new church ready in July, 1939. Contract signed by Fr Hogan, P J Knudson (Builder) and E A Tolhurst (Architect) on 6 July, 1939. The cost details were: Church £4728.00; Removal of old Church £69.10; Brick Fencing and Gates £253.00; Time required to complete the work was 22 weeks. The Church was blessed and opened by Bishop J A Coleman on 17 December, 1939 with Fr F Hogan as Parish Priest. Boggabri was served from Maitland until 1875, when it was attached to the newly-formed Parish of Gunnedah. 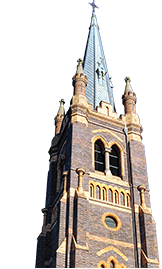 It remained a part of the Maitland Diocese until I887 when it was transferred to the Armidale Diocese which had been founded in 1871, with Bishop T. O’Mahoney (1871-1877) as the first Bishop. There would have been earlier visits by the Priests of Maitland, but no records remain. Father Dennis English, who was educated at St Patrick’s College, Thuries, Ireland and he was ordained at Pentecost in 1873. He visited Boggabri, Baan Baa, Coonabarabran and Keepit. It is recorded that on 17 th July I876, he baptised Herbert John Kennedy in Boggabri. Also, on 2 January, 1877, he officiated at the marriage of James Jones and Margaret Corcoran. Fr T English did not build the Church in 1886, but Fr Cornelius McAuliffe. The first wedding recorded after the construction of the church did not take place until 23rd July, 1888. Francis Maguire and Margaret Dillworth were the bridegroom and bride and the best man was Dominic Dillworth, with Edna Dillworth as the bridesmaid. Only the names of the fathers are recorded: Joseph Maguire and James Dillworth. The officiating priest was Fr Pauley osfc, who would have been one of the group of Franciscan Priests who came to Armidale with Bishop E. Torreggiani, osfc and was Bishop of Armidale from 1879 to 1904. Others to come to Boggabri at this time were Fr John Paul osfc and Fr Salvador. In 1889 Dean O’Sullivan was appointed parish priest of Gunnedah and at this time the Parish became a part of the Armidale Diocese. Fr James Walsh was his assistant and he became Parish Priest in 1903 to 19I8. Fr M Ronayne was his assistant until 1909 when Fr D Keane came to the Parish. Boggabri was declared a parish in 1924 and it comprised Boggabri, Baan Baa, Maules Creek and Emerald Hill. The first priest was Fr L.J. O’Reilly and he lived at the Royal Hotel. On the 10th October, 1926, the new presbytery was blessed by Bishop J.P. O’Connor on land that had been donated by the Tebbutt family. This imposing structure cost £3000‑00‑00. Father, later Monsignor in Moree, remained until I938, but before his departure, he cleared the Parish of debt and left £2,000.00 for a new church. Fr O’Reilly was very active in civic affairs ‑ P.A.& H. Society, Chamber of Commerce, Anzac Day celebrations, Wean Races and he fought for the installation of water and electricity. The first recorded baptism in the new parish was that of Patricia Alice Dillworth, born 17 th March, 1924 and baptised on 22 March, 1924. Parents John James Dillworth and Brigid Walsh. Godparent Margaret Walsh. The first marriage between Norman Victor Stanford and Frances Evelyn Ryan. The parents were George Stanford and Sarah Eather and Thomas E Ryan and Mary Maher. Attendants were M. Urquhart and C Hobin. Celebrant Fr L. J. O’Reilly. Fr Franics Hogan became the second Parish Priest in 1938 and remained until his death on 7 July, 1961. He is buried in front of the present Sacred Heart Church, which he saw completed and Blessed by Bishop J.A. Colernan of 17 December, 1939. The cost of the new church and the removal and setting‑up of the old church on its present site was only £5050‑10‑00. The architect was Mr E.A. Toihurst and the builder Mr Peter Knudson. The last baptism in the old church was that of Stanley Francis Nicholas born 11 October, 1939 and baptised 22nd October, 1939. The parents were Valentine Nicholas and Margaret Emily Laird: Godmother: Margaret Elizabeth Laird. Fr Hogan was the celebrant. The last wedding was that of David Thomas O’Shea and Jean Edna Wilson which took place on 9th December, 1939. The parents were Thomas O’Shea and Margaret Woods and Emest Wilson and Hannah McGinnity with AR. O’Shea and A.J. O’Shea as bridal party. The first baptism in the new church was that of Michael Patrick James Gray born 5th December, 1939 and baptised on 25th December, 1939 by Fr Hogan. The parents were Michael Gray and Isabel Nairn. Godparents, George Hughs and Beryl Hill. As the Gray family were visitors from Sydney, the first local resident to be baptised was Susan Mary Eather, born 12th December, 1939 and baptised on the 15 January, 1940. Parents were Lindsay Gordon Eather and Frances Clorine Connelly. Godparents were Arthur James Connelly and Veronica Agnes Connelly or maybe Connolly. The first marriage was that of William Arthur Elder and Ethel May Bowden on 26 th December, 1939. The parents were Willie Elder and Mary Mitchell and Samuel Bowden and Jane Lawman. Best man was J.A. Archibald and C. Hockins was bridesmaid. Fr Hogan died in 1961 and Fr James Maron was his successor. He remained until 1970 and it was during his time that the Church was built at Maules Creel and the new school was opened. Maules Creek was named by the explorer, Major Thomas Mitchell, in 1831, but we have little information about any visits by a Priest until 1914. From that year until 1924, Mass was offered occasionally at the “Willowdale” homestead of the Laird family; from 1924‑36, the hall at Maules Creek was the monthly Mass centre then is 1937, “Green Gully” homestead of another Laird family became the centre and remained until 1960. The pews and altar from the old church in Boggabri were moved to “Green Gully” when the new brick Sacred Heart Church was built in I939. From 1960‑64, the hall became the mass centre again, until the new church was built. The new church was blessed and opened by Bishop E.J. Doody on 12th April, 1964. The first baptism in the new church was that of Wendy Therese Holmes born 19th September, 1964 and baptised on 22 November, 1964. Her parents are James and Nancy Holmes and the Godmother was Margaret Laird. The first recorded marriage was that of Alexander Glenn and Jean Laird on the 11th December, 1965. Fr Joseph Lynam was Parish Priest from 1970-1981. Like Fr Hogan, in his latter years, he did not enjoy good health. During these periods, a number of administrators and assistants spent some time in Boggabri. Included in this list we have Fathers, F.P Ryan, E. Fahey, S. Campbell, J. Satterthwaite, B. Ryan, R. Fitzgerald, R.McKervery, C.McMaster, B. Flood and J. Willis. The church at Baan Baa remains a mystery. We know that it existed before 1920, but there is no record of its construction. Fr. W. M Dowd became Parish Priest in 1981. After the old church had been moved to the present site, extensions were added and it became the Catholic Hall and in 1964 reverted to a school. In the history of the church, often one devoted group of people is forgotten. Housekeepers give their services in the Presbytery, so that it may be a home for the priests and that they enjoy regular and wholesome meals. Noted over the years in Boggabri are: Ethel Elder, Alma Reddon, Bessy Chapman and Margaret MacKenzie. Groups who served the parish include: The Sisters in many aspects of the Parish; the principals, staffs and students of the school, the Advisory and Financial Committees, the Parents and Friends committee, the School Board, who assist the Principal and staff and school, The Catholic Women’s League, The Planned Giving Committee, The Fair Committee, The St Vincent de Paul Society, The Catechists, The Special Ministers of the Eucharist, Acolytes, Readers, Organists, Collectors, Church Cleaners and Sacristans.